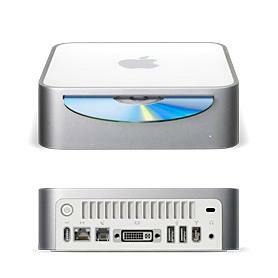 New Mac mini: $499 for a complete G4 Mac!!! Two versions for the MacWorld-announced Mac mini: this ends up speculations and sparkles new (good) times for the Mac platform. The Mac mini is a full G4 iMac with no screen but plenty of features - and a low price tag too! Mac OSX has never been so affordable and the switch from Win to Mac so easy! As big as a portable DVD player, the Mac mini finally gets Apple on the run of the 'everybody wants it - and can pay for it' melody. "iBuy, iConnect, iMac mini"... isnt'it? Not to mention that, with a DVD player and a Firewire port, it's the perfect companion to both TV sets and... iPod!